What is more important as we age than aging well? What is more important than performing at our best both physically and mentally? Most folks would tell you, nothing. And they are right! It is the one thing we cannot stop and yet now, we CAN at least do so with grace and quality of life. We hope you are as excited as we are to see what New Earth nutrition supplements and natural health products can do for your health and your life! We have a 90-day no-risk guarantee that you will notice better health, or we will gladly refund your money. Our most popular healthy aging products are: Wild Essentials, Essentials Blend, Body, Mind, Flex, Rebound, Energy, and Renew. Many of these products contain organic wild microalgae. See below for a brief description and benefits of our top selling New Earth products. Scroll down to see our best selling natural health products. OR you can order online HERE or click on the order link below for each product. New Earth Products Review: Made from wild bluegreen algae (wild microalgae). Premium quality whole natural supplements, powerful superfoods, and 100% pure ingredients that have received certifications of Kosher, Paleo, USDA organic, and Halal. The New Earth company manufacturing center is registered by NSF International to GMP, and GMP for Sport. New Earth offers the highest quality and standards in the food supplements industry. Essentials for improved digestion and nutrition is a 1 month supply of daily packets containing Body, Mind, Acidophilus, Bifidus, and Enzymes. To see all of the New Earth products, natural whole food supplements, and algae supplements go to the New Earth Product page. Joining New Earth as a Preferred Customer is a great way to enjoy consistent product benefits and access discounted prices. When you enroll as a New Earth Preferred Customer, you are agreeing to receive your shipment of New Earth products automatically each month and will save 10% on any product order you place. As you shop, you will see Preferred Customer prices, and enjoy a 10% discount off retail prices. When you are ready to check out, just create your account information, choose a shipping method, and enter your payment information. We have a 90-day no-risk guarantee that you will notice better health, or we will gladly refund your money. You can also make changes to your monthly Autoship order anytime you like — free of charge. It's easy to change the products you are receiving, the payment method, or the scheduled shipping date. Nutritional supplements can provide the support and prevention that you need as you get older. The best dietary supplements are made with all natural ingredients, whole natural foods, herbs, and pure clean superfoods. Who takes supplements, dietary supplements, nutritional supplements, or vitamins? Millions of people in the United States are using dietary supplements, and a majority of adults are using supplements to enhance their overall health. Research indicates that usage is higher with women than men and use of supplements will increase significantly with age. The study of dietary supplement usage has shown that the majority of adults in the United States are taking a supplement to promote a healthy lifestyle and to achieve optimal health and wellness. To increase or improve immune response. People over 65 are the fastest growing age group in the United States. By 2030, their number is expected to more than double, to be almost a quarter of the Country’s entire population. Chronic disease prevention is a primary concern and goal for optimal community health. Unfortunately, chronic diseases such as diabetes and heart disease affect older adults more than younger people. Healthcare professionals, doctors, caregivers, fitness and wellness coaches are working with older adults to emphasize that healthy living and maintaining healthy habits are the key to preventing chronic diseases. Health experts say if you want to decrease the risk of chronic disease, do the following things on a regular basis: exercise, be active, engage in recreational activities, walk, stretch, eat well, don't eat too much or too little, watch your calories, drink water, eat a balanced diet, eat natural foods, get regular check-ups, physical exam, get enough sleep, don't stress out, and consider taking nutritional supplements that will provide extra nutrients, vitamins, minerals, amino acids, probiotics, calcium, and other essential natural foods that can support your health. 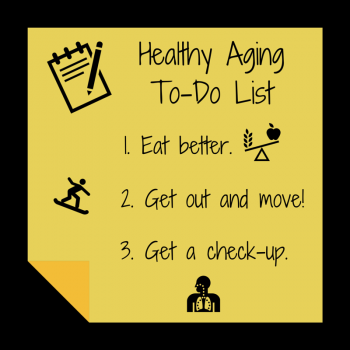 It's not always easy to focus on our health, however, it becomes very important for older adults to maintain a healthy lifestyle, and to be proactive so that they can live the longest, healthiest lives possible.